I've been building tables for the Wild West Exodus miniatures game pretty much since its inception. Every one has been a unique design that presented its own set of challenges. This year Warcradle Studios has commissioned me to build a port city, complete with a ship docked in the harbor. In this project log, I will be documenting the progress of the table over the weeks between now and Gencon. 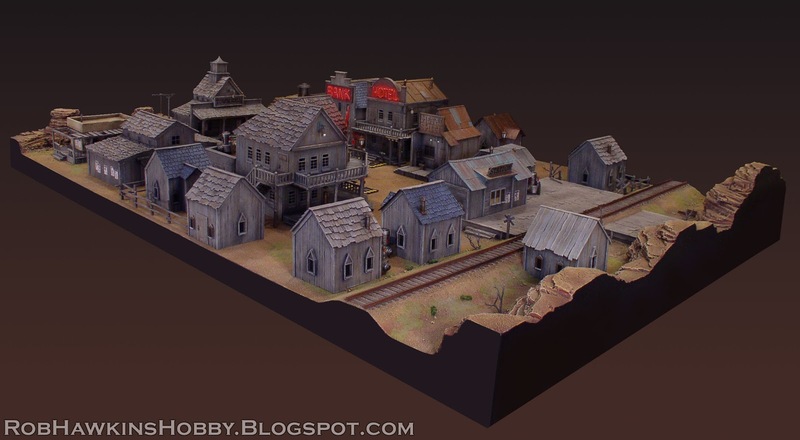 If you attend the show this year, you'll be able to see the board in the Wild West Exodus booth. The Harbor is a 4' x 4' board, and the first thing I did was build the wooden frames for the table halves. The left half is a box-frame, and the right half is an MDF base with the harbor walls framed out on top of that. The two halves separate for easier transportation and storage. The concept called for a cutout with steps leading down to a lower pier. I used a scroll saw to cut out the space before assembling the frame, and built up the platform and wall with insulation foam. The columns on the harbor walls were cut from square dowels, with their tops beveled at a 45-degree angle. I cut grooves to mark concrete blocks into the side of each column, and hammered them against a piece of stone to press a rough texture into them. The fronts of each were then covered with a strip of thick styrene card, punched with rivets from my trusty rotary hand sewing punch. The street surfacing came next– I wanted to make a paved surface with exposed cobblestones underneath, so I placed patches of brick-textured styrene card here and there, using Liquid Nails to adhere them. Next, I spread wood filler putty over the surface, around the brick patches. ...and then etched them into the putty with a sculpting tool. The last step was to paint a thin mix of water and wood glue over the surface to protect it all. In this shot, you can see how the texture of the putty is evocative of rough concrete, with the cracks and exposed cobblestone breaking up the surface. To make the concrete bricks on the harbor walls, I cut thin slices of insulation foam and scored in the bricks with a hobby knife. Each section of wall was measured out, and the foam bricks spaced between the columns. The lower piers were also covered with the foam bricks. I used Liquid Nails to attach the foam, and then drew along the knife scores with a pencil to press in the gap between each brick. The foam was then pressed in with my thumb and an eraser to add some variance in the depth of each brick. Finally, I rolled a ball of aluminum foil over the surface to create a rough stone texture. Everything was painted with a wash of watered-down wood glue and then with black latex paint to protect the foam. Next, I moved on to adding the metal framing. I used a series of styrene L-strips and card to cover the corners and tops of the columns. The stairs were made by stacking thick plastic L-strips up the slope. PVC pipe was used to make the large drain pipes. Aside from a few details, that takes care of the harbor walls. Now it's on to the buildings and other elements on the streets. Fantastic looking scenery - thank you for sharing them. The foil ball is genius. Creative job and awesome scenery, congrats! 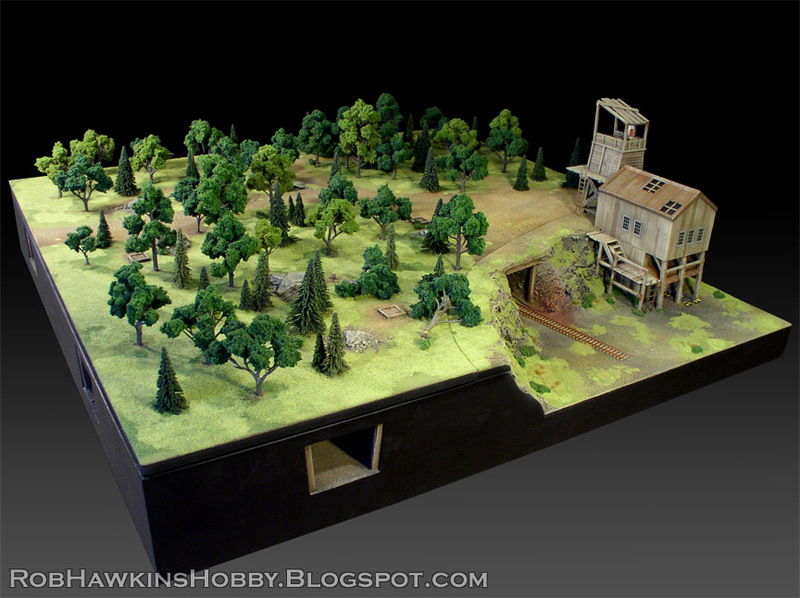 That's some fantastic looking terrain. The level of detail and thought you put in those is astonishing. This really rises up high above the types of terrain you usually see. Fantastic work as always! Looking forward to seeing how this turns out, especially the water effects. Wow! 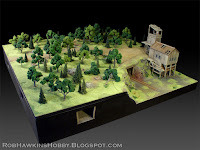 As a model railroadwr and very new player, I say well done!